Add visual interest and rustic charm to your dining area with this pair of Eleanor chairs from iNPSIRE Q.
Rustic refinement and contemporary livability come together to create a classic style that'll look beautiful in any dining space . Vintage elements and contemporary livability come together to create a classic style. With an American traditional design aesthetic that favors updated basics and an eye for details. 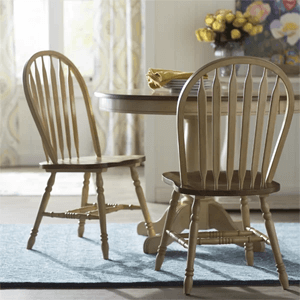 Attractive as well as functional, the Farmhouse Dining Chair set draws on traditional influences to create a classic piece of furniture for today's busy lifestyle. With an American traditional design aesthetic that favors updated basics and an eye for details, Alcott Hill offers comfortable and easy ways to refresh any home. Turned spindles and pressed designs on the chair back of this side chair offer traditional country styling. This item includes: CO-102312 Rolien Chrome Dining Chair 24.5L x 18W x 35.5H Seat Depth: 17.75 Seat Height: 18 The price is for each chair must be purchased in pairs. Solid Wood 36 In.(H). All Natural Chairs With Arrow Back. Comes ready to assemble. Must be purchased in quantity of 4. Price quoted is for each chair. Comfortable and casual with a light and elegant flair, this dining chair features a framed lattice back with an inset upholstered pad, and an interwoven webbed poly Dacron seat covered in a rich brown microfiber, 100% polyester topped with a stepped edge curved crest rail, supported by shaped tapered legs, and finished in a soft, medium sheen, espresso. Some assembly required using 10-bolt construction. 2 chairs per box. Minimum order is two. Size: 20-1/4 In. x 23-3/4 In. x 40-1/2 In. tall, Seat Height: 18-5/8 In. Sit in comfort, while adding style to your home with this beautiful chair Wooden chair Fully assembled Shaped seat and turned legs Seat height 17.5 In. Seat width 17.5 In. and has a depth of 15 In. Sit in comfort, while adding style to your home with this beautiful chair. Solid oak and oak veneer Fully assembled Seat height 17.5 In. Solid oak and oak veneer Seat width is 17-3/4 In. and has a depth of 16 In. Solid Wood Casual Chair. Size:39. Easy to assemble. Available in Maple or Cappacino Finish. Beautifully Designed 5-Pc Dining Set. This Set Includes A Dining Table With Imitate Marble Top And Dark Oak Finish Legs. The Table Is Available In Two Widths, 60-Inch Width Or 48-Inch Width. Also Included Are Four Leatherette Parsons Chairs. Additional Chairs Can Be Purchased Separately. Made From Solidwood, Veneer And MDF. Strong Construction. Easy To Assemble.Dimensions:Small Table: 48 In. x 36 In. x 31 In. (H)Large Table: 60 In. x 36 In. x 31 In. (H)Side Chair: 25 In. x 18.5 In. x 39 In. (H)Matching Coffee Table Available. See Related Items Below. Side Chair Size: 42 In.(H). This solid oak and oak veneer chair is the type of chair that will be trendy forever.